Cream eye shadow is something I generally avoid. 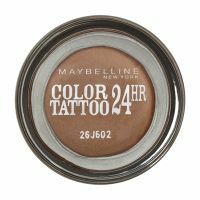 But there's been so much hype about Maybelline's "Color Tattoo" that I picked a few up at my local drugstore. They're incredible! I got them in "Edgy Emerald" to enhance my hazel/green eyes and "Bad to the Bronze" (just a great color to have). This is a creamy-gel texture which is easy to work with. I used my fingers when applying to eye and th...read moreen smoothed the edges and a bit of shadow under my bottom lashes with a brush. They are shadows with sheen, but not to the point where they can't be worn anywhere. The color is true and really stays put--I didn't want to give it a twenty-four hour test, but it stayed in place a good eighteen hours for me before I removed my makeup. There was no creasing or caking whatsoever. It does dry very quickly after application, so be sure you have shadow where you want it before it sets (that's not a criticism--that's part of the reason it lasts so long). I'm more than impressed and am going to collect "Painted Purple," "Audacious Asphalt," and "Tough as Taupe" (just for now). "Bold Gold" would be great to have for highlights or all-over eye drama. I love that there is finally, at long last, an eyeliner of this type available at the drug store price point. This has highly pigmented and intense color, and I love the formula. I apply it with an angled eyeliner brush and found that you can get a really beautiful line. I like this eyeliner a lot. I know its a shadow but with the right brush and the right steady hand, you can use it as an eyelin...read moreer as well, which is exactly what I did. I love that the formula is versatile enough to allow this product to be used in two different ways and still give very good result.